The first explosion lifted Elder Mason Wells off the ground. Seconds later, as he ran for an exit at the Brussels airport, the second blast detonated. 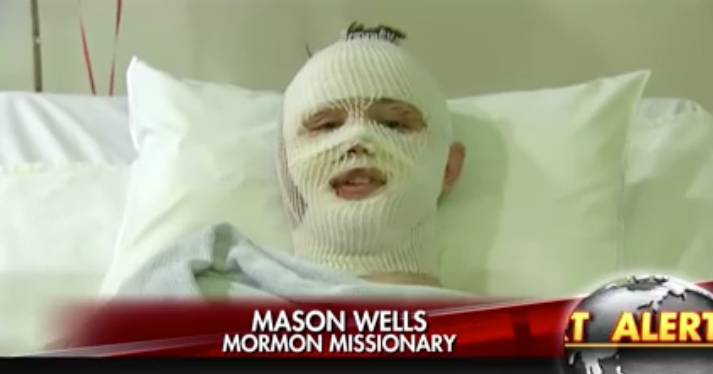 Sitting in a hospital bed with his head wrapped in gauze, Elder Mason Wells gave TV interviews Friday, describing a chaotic, gruesome scene from the terrorist attack that left him covered in blood and caused shrapnel wounds and burns to him and three other Mormon missionaries serious enough that all four have required surgery. Elder Wells, 19, of Sandy, Utah, who was reunited with his parents on Friday, also told interviewers that despite the attack, his faith in God is intact. Elder Wells and two other missionaries were at the airport just before 8 a.m. on Tuesday to drop off Sister Fanny Clain, 20, of Montélimar, France, who was scheduled to board a flight to the United States to serve in the Ohio Cleveland Mission of The Church of Jesus Christ of Latter-day Saints. Elder Wells said he was trying to help Sister Clain get her plane tickets to the United States out of a small machine at the airport before the first of two suicide bombs detonated. That was part of his responsibility in the France Paris Mission of The Church of Jesus Christ of Latter-day Saints. The Paris Mission includes Belgium, and Elder Wells had moved to Brussels five weeks earlier. Brave Elder, thank you for standing tall. You are a fine example of what a Mormon Missionary should be. I continue to pray for your fast recovery.